"Insurgent" impact: Hollywood must have a Fairy Godmother who helped launch "Cinderella" to $70.1 million last weekend and blessed "Insurgent" with through the roof tracking for its Mar. 20 opening. Walt Disney Pictures 'PG rated live action family adventure drama "Cinderella" kicked off on the right foot with record-setting fairy tale style grosses. It ranks as the sixth biggest March opening ever and the third biggest March opening ever for a Disney release. "Cinderella" also danced through the weekend internationally with $62.4 million in grosses from 31 territories, including China with a dazzling $25 million that is the country's biggest March opening ever. Those numbers are even more impressive since "Cinderella" is not a 3D release and 3D is typically a big driver of international box office grosses. Ticket sales to "Cinderella" will clearly keep the multiplexes humming for weeks to come. Directed by Kenneth Branagh ("Thor"), it stars Lily James (Lady Rose on "Downton Abbey"), Hayley Atwell and Helena Bonham-Carter. Meanwhile, Lionsgate and Summit Entertainment'sPG-13 rated 3D sci-fi adventure thriller "Insurgent," arriving at about 3,750 theatres (including IMAX play dates that will boost its box office total),is about to crank up the box office heat this weekend. The pre-opening buzz has it following closely in "Cinderella's" rarified footsteps. As the second episode in the "Divergent" franchise it's got the benefit of strong awareness and very high interest scores in tracking reports. It's tracking in double digits as an overall first choice. As was true of "Divergent," the sequel's biggest appeal is to women under 25, with about two-thirds of them expressing definite interest in seeing it. It's also tracking almost as brilliantly with women over 25, about half of whom say they're definitely interested. These are the kind of tracking scores that would be on any studio's wish list. Understandably, Hollywood handicappers are anticipating unenviable opening weekend impact of around $60 million or more for "Insurgent." "Divergent," opened Mar. 21, 2014 to $54.6 million and grossed $150.9 million in domestic theatres. The franchise's next episode, "Allegiant: Part 1" is scheduled to open Mar. 18, 2016. "Allegiant: Part 2,"the concluding episode, is to arrive Mar. 24, 2017. "Insurgent's" story, Lionsgate explains, "picks up three days after the end of 'Divergent,' when Tris (Woodley) and Four (James) narrowly hindered Jeanine's (Kate Winslet) plot to use mind-controlled Dauntless troops to exterminate the population of Abnegation. But the victory comes at a terrible personal cost for Tris. Both her parents are killed in the battle, as is her fellow Dauntless initiate Will, whom she is forced to shoot when he attacks her under the influence of a brain-altering serum." Like "Divergent," the sequel takes place" in the ruins of a futuristic, walled Chicago where survivors are divided into five factions based on their abilities, temperaments and personal preferences. Members of the Abnegation faction are selfless, Amity are peaceful, Candor are honest, Dauntless are brave and Erudite are intelligent." Those who don't fit into any of those faction groups are labeled "Faction less." In "Divergent," Beatrice "Tris" Prior, who had grown up as Abnegation, finds out through a government-administered aptitude test that she's actually Divergent given her multiple faction attributes. That's bad news because Divergents are regarded as independent thinkers who can't be controlled by any faction – which makes them dangerous. When Tris realizes her traits put her at risk, she joins Dauntless to conceal her Divergent identity. But her rigorous training requires her to participate in hallucinatory simulations (SIMs) that reveal her true nature and abilities. Tris finds a friend, who later becomes a love interest, in Tobias "Four" Eaton, a Dauntless instructor and expert fighter who also turns out to be Divergent. As Divergents are hunted down by Jeanine’s brutal military, Tris and Four team up to stop her. "From the first pages of the book 'Insurgent,' we knew that Veronica Roth must have been drinking rocket fuel when she wrote the story," says producer Douglas Wick. "It starts with Tris being chased, and the action never lets up. We built the world in 'Divergent' and now in 'Insurgent,' we tear it up." "The book release of 'Insurgent' was when the 'Divergent' series truly took off and became a publishing phenomenon," observes producer Pouya Shahbazian. "Veronica wrote a roller coaster of a book with incredible twists and turns that really captured the imagination of fans, who spread the word like wildfire. 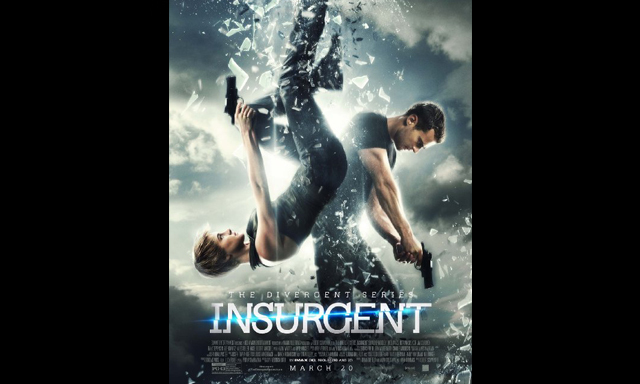 "In 'Insurgent' the city is in upheaval and new secrets are coming to light. While in the first movie, Jeanine pinpoints the Divergents as being a problem she wants to eliminate, in this movie, we learn very quickly that Jeanine is determined to capture them and use them to discover a powerful secret to which only they hold the key." Writing "Insurgent," according to Roth, enabled her to establish Tris' world in a way she wasn't able to do in 'Divergent,' in part because her first book had been written in the first person. "It's a little bit like growing up," Roth says. "When you’re a child, the world is very small, and when we get older, we realize how large the world really is. 'Insurgent' is the world getting a little bit bigger and Tris is experiencing that in a very literal way…first it's one faction, then it's two factions, then it's the entire city of Chicago." 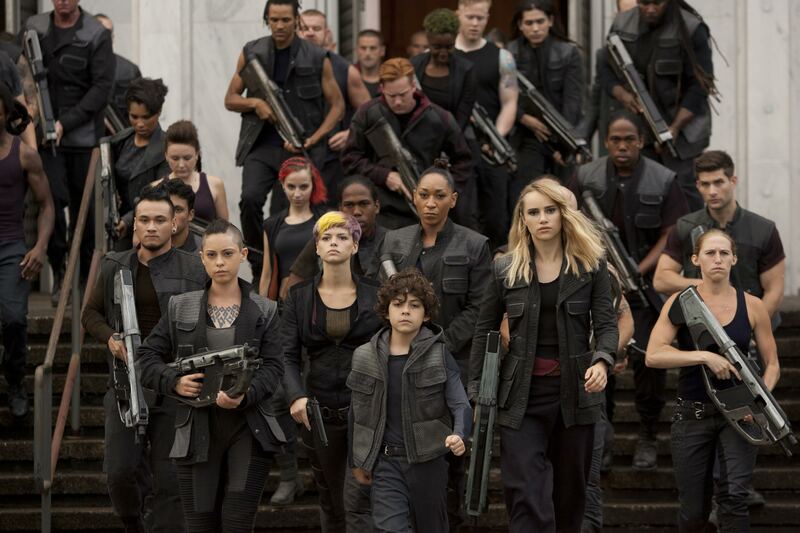 As Tris and Four are on the run seeking answers in war-torn Chicago, the audience is journeys through each faction's unique and visually arresting environments. "In the first film, we saw these fun and visceral full-metal-jacket training sequences, but they were confined to the dark and gloomy Dauntless compound for much of the film," Wick notes. "In this movie, we start off in the beautiful lush fields, honeycomb beehive dome and signature tree of Amity. Then they travel to Faction less, where we see this curiosity of functionality and aesthetics in a wondrous, slightly enchanted and disenfranchised place. Then the characters go to Candor and we encounter what these starkly dressed, unrelentingly honest people are like, and finally we check out the depths of the Erudite world inside Jeanine's high-tech lab." The film's most impressive landscapes are within Tris' mind. After attacks on the factions helping Tris, Four and the Dauntless rebels by providing refuge, Tris realizes the only way to stop Jeanine from hurting anyone else is to surrender to her at Erudite headquarters. It's there that Jeanine puts Tris through increasingly intense series of SIMs. "The SIMs are a defining characteristic of this movie in terms of style and tone," producer Lucy Fisher points out. "The internal forces influencing Tris are even more dramatic, more colorful, and more riveting than the external ones. In her SIMs, she has to contend with all of her demons and, luckily for us, director Robert Schwentke and visual-effects-maestro James Madigan concocted a way to show us what's inside Tris' head that's so visual and so exciting that even though her dreams are torturous for her, they're really exciting for us to watch." Shahbazian agrees: "The SIMs are so action-packed and so imaginative. They have taken what Veronica wrote and added to them, made them more explosive and more cinematic with the most cutting edge filmmaking technology available today." In adapting Roth's best-selling books, the filmmakers understood their huge responsibility in bringing them to the screen. "The 'Divergent' series has sold well over 30 million copies," notes Wick. "Whenever we got a little lost about what liberties to take in streamlining the story, we always remembered that Veronica was the oracle. Whatever good idea any of us thought we were having, we also remembered people bought Veronica’s books, not ours. "We're very lucky to have a living author to consult with. On our last movie ("The Great Gatsby"), F.Scott Fitzgerald wasn't really available (having died in 1940). Veronica was very much a part of this process as a resource and sounding board." Roth appreciated the care that went into bringing her work to the screen: "Doug and Lucy have a lot of respect for the story and that's a huge asset. They understand what works and can pinpoint what will be difficult to translate." While the filmmakers tried hard to stay true to the books' themes and characters, Roth understood that some changes would have to be made to turn her 544-page novel into a two-hour movie:"In the book, there's more freedom to do a weird structure and explain things slowly. But on screen, it has to be fast and concise and clear. "I'm always really open-minded to change as long as it creates a better and stronger story. One thing that was very important to me was to ensure that the dynamic between Tris and Four remained the same, and that she is still the primary mover of the plot. And in 'Insurgent,' it is still Tris' story." "Tris is guilt-ridden," Woodley explains. "She's lost her mom and dad, and unfortunately, she had to shoot one of her friends to preserve her own survival and stop any further destruction of Abnegation. We find her a little bit numb, and confused. She doesn’t quite know exactly who she is." Roth says each book was designed to describe a different aspect of Tris: "One of the definitions of the word 'insurgent' is someone who rises up in peaceful opposition to an established authority. That is exactly what Tris does in 'Insurgent.' She’s traumatized from what happened at the end of the first installment, but she has to figure out a different way of fighting the system than with a gun alone." The second book's darker quality is part of what appealed most to Woodley. "The story is much more in her head, dealing with traumatic events," she says. "I really responded to that. It seemed very psychologically suspenseful. Coming back into this world again, I assumed it would be easy, because we knew the characters and story so well. "But the storyline has shifted and the relationship between Tris and Four is evolving, like it does when one member of a partnership goes through something traumatic. I feel so lucky that Theo and I get to work together. He’s such a class act. We both have similar rhythms and ways of approaching the work. You become a family during filming and then you disperse. But in a franchise, you get to come back and have the comfort of the tribe once again." Bottom line: What makes "Insurgent" and "Cinderella" particularly interesting success stories is that they're both targeted to female moviegoers, an audience Hollywood often neglects. Studios routinely pursue the under-25 male audience with comic book based fantasy action adventures and special effects driven sci-fi epics. "Insurgent" and "Cinderella" are a great reminder that female ticket buyers are also a powerful audience that can drive ticket sales in a big way.